Encompassing experimental and exploratory animation techniques, film production processes, conference papers and public exhibition lectures, the research focuses on Pankhurst’s role in influencing political structures in the UK during a time of extraordinary change and revolution across Europe. Through the research Ashworth aims to examine Pankhurst’s actions as a way of understanding the evolution of the modern self, the artist’s role and world politics. 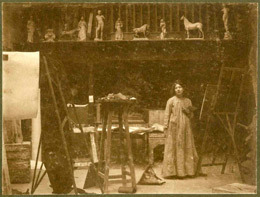 Pankhurst is best remembered as a key figure of the Suffragette movement, but her first ambition was to become an artist and she graduated from the Royal College of Art in 1906. For this project I have explored a number of archives for evidence of Sylvia’s life, work and personal reflections. Eminent writer and mythographer Marina Warner writes that “the archive has become a mesmeric place, not only for memory but also for creative energy, for fantasy.” This project aims to examine memory to help create new conjunctions of image and sound, to help look at Pankhurst’s work in a new way. The aim is to get behind the surface of her drawings and explore the people depicted. It looks at Pankhurst as an artist and campaigner through the lens of today. Informed by primary research at the International Institute of Social History, Amsterdam (which holds Pankhurst’s notebooks and manuscripts), the British Film Institute, the Museum of London, the British Library and National Sound Archive, the National Portrait Gallery, the Pankhurst Centre, Manchester, and the Women’s Library, London, the website presents a shift in Ashworth’s practice towards working with the real, exploring what animation tools can bring to documentary film and to archives. The research has brought Ashworth into contact with a number of feminist activists and their contemporary methods of visual activism and use of social media. This project was inspired by a letter to the Tate, written by The Emily Davison Lodge (Olivia Plender and Hester Reeve), and first exhibited at the Women’s Library in 2010 as part of their Out of the Archives exhibition., and later at at Tate Britain as part of BP Spotlight: Sylvia Pankhurst. The examination of Sylvia Pankhurst’s life and work is timely, with a number of important anniversaries occurring or imminent, including the 1913 Derby at which suffragette Emily Wilding Davison was fatally injured under the King’s Horse, the passing of the Representation of the People Act, 1918 and Eligibility of Women Act, 1918 which gave some women the right to vote. In 1928, all women were given the right to vote. Sylvia continued to campaign for the rights of others up until her death in 1960.